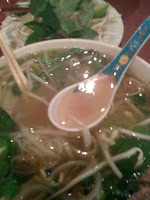 Where do we go in Salem for Pho? We head out Silverton Road to Kim Huong Restaurant. It's in an unassuming storefront next to a small oriental grocery A-Dong Market. It is the only reason I truly head out Silverton Road these days unless it's August and I'm going to the Oregon State Fair. I digress. The Pho is outstanding. Joe never fails to order it in one of it's many varieties. He prefers the type with tripe and other stuff - "for the flavor." Tonight, Gabe followed his father's lead and ordered #4 as well. While chatting, chatting, chatting with his brother Gabe suddenly dropped his spoon. I giggled and asked him what was the matter. He explained, it was sort of like an iceberg. On the surface it looked fine, but once he started in it kept going and going and going. Although he was unsure of what "it" was. It was the tripe. We didn't discuss it any further. I usually have the best intentions of actually ordering the Pho but always seem to be charmed away by the Grilled Shrimp Bun. Oh, how I love the Bun. Cool and refreshing with delectable warm, grilled shrimp to boot. Jake chose a different path tonight and was mighty pleased with the Sweet and Sour Prawns. To clarify, this is not Sweet and Sour Shrimp, these were light and airy with a deeply colored sweet and sour sauce. Delectable. Our choice for Vietnamese food in Salem always finds us heading down Silverton Road.